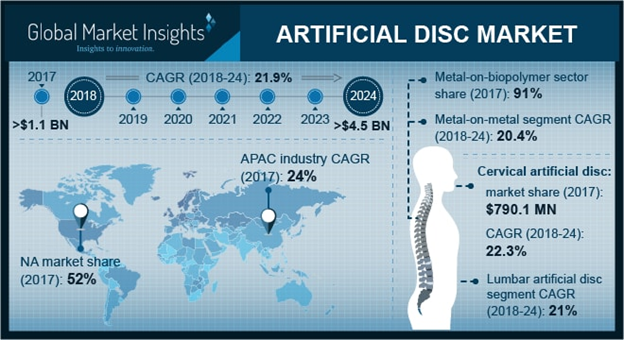 Artificial Disc Market size is set to exceed USD 4.5 billion by 2024; according to a new research report by Global Market Insights. Rising prevalence of musculoskeletal diseases such as degenerative disc diseases will drive the global artificial disc market over the forecast period. Growing adoption of sedentary lifestyle coupled with lack of physical activity will surge the number of musculoskeletal cases worldwide. Chronic low back pain is highly prevalent among adults aged 60 years and above. Rapidly growing geriatric population base suffering from degenerative disc diseases will increase the demand for minimally invasive spine procedures, thereby accelerating the artificial disc industry growth. Technological advancement in artificial discs will serve to be another positive impact rendering factor that will surge the artificial disc business growth. Industry players are focusing on developing novel technologies and improvising the existing products. For instance, in 2013, Mobi-C, a two-level artificial disc, was launched by Zimmer Biomet in the U.S. Availability of such multi-level artificial discs for patients having issues at two consecutive spinal disc will fuel the demand for such advanced products. Furthermore, increasing investment in R&D to develop innovative products will upsurge the artificial disc market growth. However, stringent regulatory framework for approval of artificial discs may hamper the artificial disc market growth. High cost of implants coupled with lack of reimbursement for disc replacement may further impede the artificial disc market growth. Metal-on-biopolymer segment dominated the artificial disc market in 2017, with USD 1 billion revenue and is projected to witness lucrative growth during the analysis timeframe. Metal-on-biopolymer artificial discs have better biocompatibility and offer ease of insertion as compared to the metal-on-metal discs. Increasing demand for less invasive procedures for disease treatment as well as growing adoption of artificial discs over fusion surgeries will upsurge the segmental growth during the forthcoming years. Cervical artificial disc segment is estimated to witness 22.3% CAGR over the forecast period. The segment growth is highly attributable to the benefits offered by cervical disc replacement procedures in various musculoskeletal disorders such as decompression of axial neck or arm pain. Increasing demand for motion-preserving surgeries over motion creating procedures such as spinal fusion will accelerate the market growth. Growing prevalence of cervical disc diseases among adults due to adoption of sedentary lifestyle will further boost market growth in the coming years. U.S. artificial disc market accounted for USD 541.3 million in 2017 and is projected to show similar growth over the analysis period. Increasing prevalence of degenerative disc disease in the region owing to high adoption of sedentary lifestyle coupled with lack of exercise will drive the artificial disc business growth. As per the Centers for Disease Control and Prevention (CDC) statistics, around 54.4 million adults in the U.S. were diagnosed with arthritis in 2015. Strong foothold of key industry players in the U.S. will increase the demand for advanced products for musculoskeletal disease treatment. Huge investment in R&D for development of innovative products and technology will elevate the regional growth during the forthcoming years. Japan artificial disc market dominated the Asia Pacific artificial disc market in 2017 and is estimated to witness 22.9% CAGR over the forecast period. The growth is attributable to rising prevalence of musculoskeletal diseases such as degenerative disc disease. Degenerative spinal pathology is implicated as the primary reason for chronic lower back pain in the older population. Growing elderly population base suffering from degenerative disc disease (DDD) will serve to be another major factor driving the regional market growth. Technological developments in artificial discs as well as increasing treatment affordability will spur the artificial disc market size during the forthcoming years. Some of the notable industry players operating in global artificial disc market include AxioMed, B. Braun Melsungen, DePuy Synthes , Globus Medical, K2M, Medtronic, NuVasive, Orthofix International, Paradigm Spine, Simplify Medical, Spineart SA, Stryker, Synergy Disc Replacement, and Zimmer Biomet Holdings. Industry players are majorly focusing on collaborations, mergers, acquisitions and new product launch to strengthen product portfolio as well as capitalize on market opportunities. For instance, in January 2017, DePuy Synthes and Interventional spine, a manufacturer of and minimally invasive surgery technology as well as This agreement for expandable cage technology with Interventional spine will drive its growth in musculoskeletal segment across diverse countries in the world.